Cycling is the best way to experience this beautiful island. If you are searching for an adventure that will take you through the true wonders of Ireland, and magnificent landscapes of mountain lakes and the Atlantic Ocean, then you have picked the right tour. Your self-guided cycle will take you 291 kms through the heart of Ireland’s real emerald gem; Connemara. The route takes you from a small town called Oughterard all the way along the sparkling Atlantic, and then entering Connemara National Park. You will cycle up north to bustling Westport and then descend to Leeanane and finish after a scenic cruise of Killary Fjord. On your way you will be able to enjoy famous castles, stunning beaches, the magnificent Connemara mountain ranges, charming sheep farms and experience authentic Irish cuisine. Explore one of Ireland’s most spectacular regions on this five-day tour of Ireland. You’ll capture Atlantic waves crashing against rugged cliffs, impressive castles looming over ancient monasteries, and cities bursting with myth and mystery. This is a tour that’s perfect for people who like their mountains mighty, their music merry, and their memories magnificent. Places you explore: Clonmacnoise - Scholars from all around Europe used to visit this hugely influential abbey. Galway Town - Stone clad buildings line the winding lanes and medieval walls of this ancient harbor city. 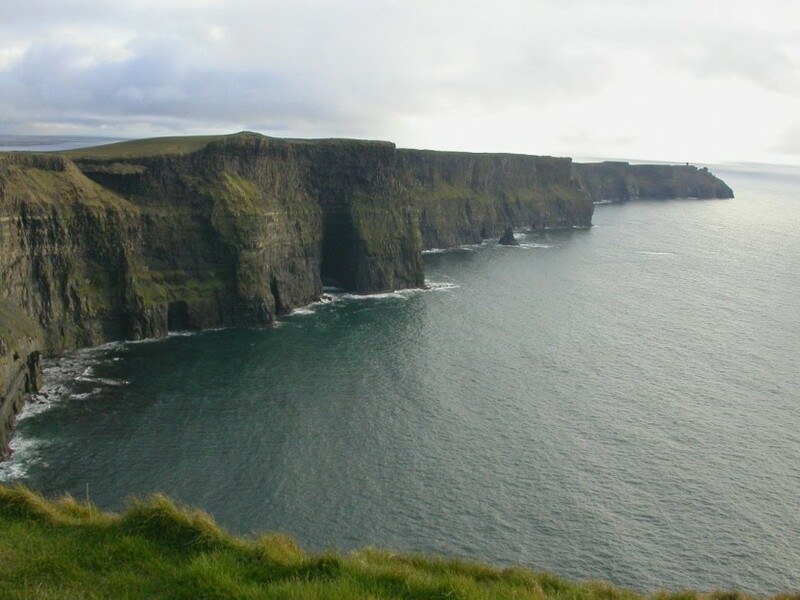 Cliffs of Moher - Behold an awe-inspiring 700ft drop into the crashing waves of the Atlantic Ocean. The Burren - This national park is home to some of Ireland’s most profound spiritual and natural culture. Dingle Peninsula - Glorious beaches merge with traditional Irish scenery in this land of Gaelic mystery and towering forts. Ring of Kerry - Ireland's famous coastal route boasts some of the wildest views in Europe. Torc Waterfall - Learn about the ancient curse that formed this waterfall and admires its impressive cascade. Blarney Castle - Kiss the famed Blarney Stone amidst the walls of this gorgeous medieval stronghold. Kilkenny - Survey the dominant and unmistakeable three walled castle whilst roaming its splendid grounds. If it is nature, history and Irish culture you want to see on a cycle tour, then this is the tour for you. Clare and the Aran Islands cycle tour offers a multitude of experiences. We’re a tad spoilt for choice when it comes to remarkable roads in Ireland. 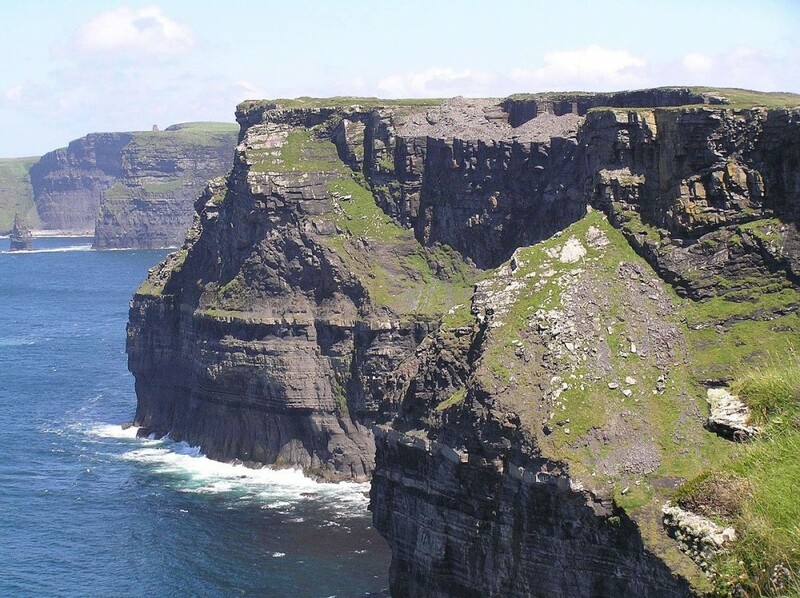 You will see some of the finest natural attractions Ireland has to offer, such as the Cliffs of Moher, the Burren National Park, Corcomroe Abbey and the great stalactite in Doolin Cave. You’ll also visit Inishmore, the biggest of the Aran Islands and home to the ancient fort Dun Aengus. By choosing to cycle Ireland, you get to experience the beauty of this stunning island at the perfect pace. We will take care of your accommodation and luggage transfers and also provide all the essential maps and tour documents as well as a 24 hour emergency helpline. No need to worry! This wild Atlantic adventure won’t be soon forgotten! The Wild Atlantic Way South: Your journey begins in Dublin and ends in the bohemian city of Galway. We start our adventure with a visit to the Rock of Cashel, once home to the King of Munster. We then head on to Kenmare. The Wild Atlantic Way South takes you from the charming town of Kenmare famous for traditional music, brews, and delicious seafood to the bohemian city of Galway. Take in the most scenic coastal drive in all of Ireland with fantastic adventures and culture along the way. Hike along the world famous Cliffs Of Moher, enjoying the spectacular views and kayak the deep blue waters where wild dolphins await. Embrace your inner-adventurer as you experience one of the most stunning and naturally striking places of Ireland. Our tour doesn't neglect the historic importance of the Wild Atlantic Way and you will visit many areas of historical significance including Megalithic tombs, Abbeys, and Castles. We will also visit the spectacular Skellig Michael, an ancient monastic settlement that is simply breathtaking. Our guides are highly trained and are knowledgeable in many areas including history, geography, folklore and Irish culture. They will also immerse you in the local community and make your trip exciting and fun. We work closely with local adventure providers and guesthouses so we can guarantee a warm welcome and a truly unique experience. Welcome to our all Ireland Emerald Tour! Get ready to enjoy our 15-day walking tour with the best and friendliest guides in the business that will take care of your every need. You will travel through the east, west, south-west, and northern regions of Ireland and explore mountains, picturesque villages, cliffs and rugged untouched beaches. As you travel through Ireland you will experience fantastic landscapes and breathtaking views. Some highlights of your fascinating tour include the UNESCO World Heritage listed site - the Giants Causeway; the Slieve League cliffs which are the highest sea cliffs in Europe; Slea Head Drive, a gorgeous scenic route; the famous Cliffs of Moher with its unmatched views and Killary Harbour where you will walk in the footsteps of those who suffered during the great Irish potato famine. See historical castles and learn about Irish legends. These are only a sample of the sights you will see throughout this journey of a lifetime. Each traveler takes away an enriching and unique experience. You view the highest peaks and the deepest fjords, meeting Ireland’s friendly locals along the way. On this tour, you are immersed in the Irish way of life and your experienced guide will introduce you to local traditions as well as the best views you'll ever experience. Immerse yourself in traditional music in wonderful pubs frozen in time. Taste traditional dishes and seafood along the Wild Atlantic Way. We guarantee you will make new friends and create fantastic memories as you explore the island of Ireland. On this tour, you will be traveling one of the most famous counties in Ireland and deservedly so, with spectacular mountains, lakes, charming towns and villages and archaeological sites that date to 5000 BC. This tour will take you to some of the most scenic and remote areas of Ireland. You will stay in the amazing Connemara, travel to the Aran Islands and then finally stay in Doolin and the Burren National Park. Throughout the trip, you and your friends will enjoy relaxing walking tours with spectacular views.